If it's December, it's holiday show time. 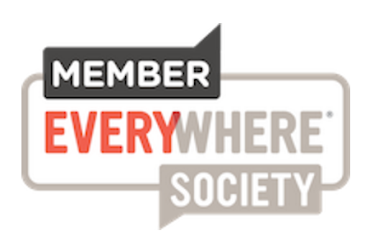 Holiday shows are a substantial portion of a non-profit arts budget. 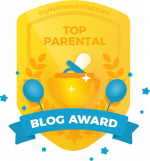 They are something you do every year, and your patrons come every year, as a tradition. If you are a theatre, you are probably performing some version of Christmas Carol. (Or Dylan Thomas' A Child's Christmas in Wales) If you are a chorus, you are probably performing some version of Handel's Messiah. And if you are the ballet, you are probably doing the Nutcracker. 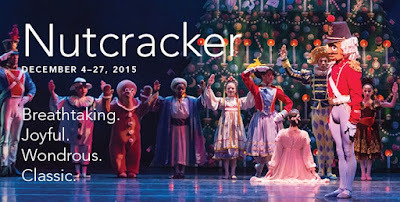 Which means it should come as no surprise that we attended the opening night of the Joffrey Ballet's excellent Nutcracker last week. I can highly recommend it. It is exactly what you want in a holiday show like this. It was full of genius dancers in amazing costumes, music by the Chicago Philharmonic, large and beautiful sets, falling snow that could be out of a snow globe, and a corps of dancers that includes 118 school children from all over Chicago-Land getting to dance in the big leagues. Everything was marvelous. 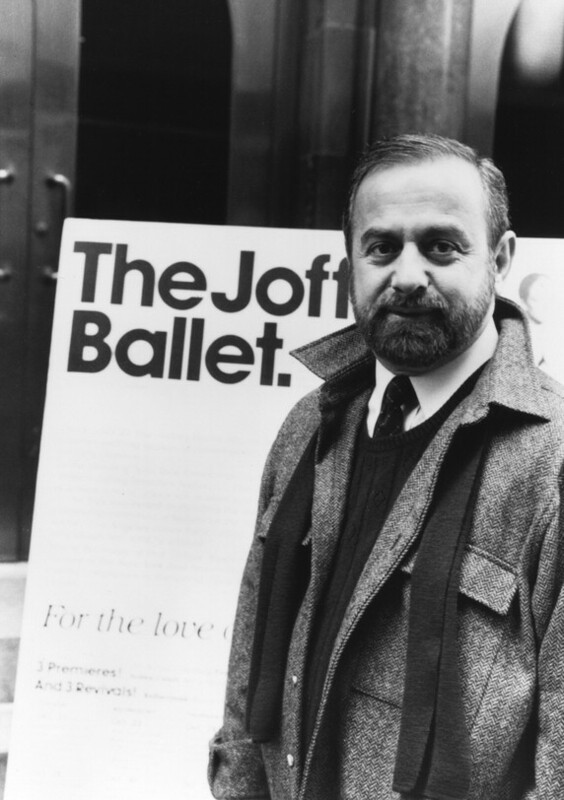 The Joffrey has been doing this ballet year in and year out with Robert Joffrey's choreography since 1987. 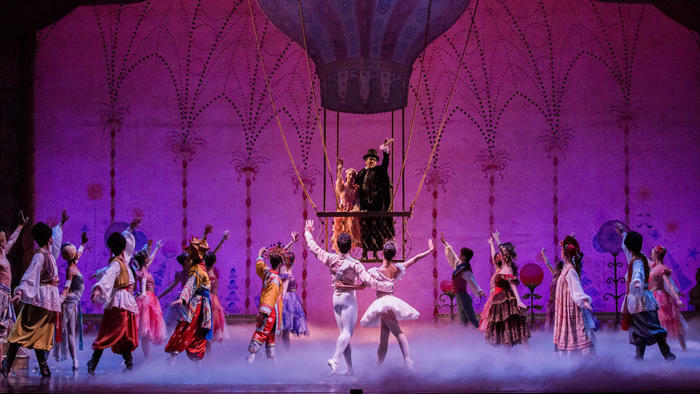 The choreography is stellar, and gives the dancers plenty of room to strut their virtuosity while telling the story of Clara, Dr. Drosselmeyer, and the legion of sugar plum fairies, toy soldiers, and mice that make up this classic ballet. I am sure that each year the sets and costumes get tweaked and made even more fabulous. And if you are a young dancer, this is the plume in your cap-- to get to perform in the Nutcracker with the Joffrey on the big stage of the sumptuous Auditorium Theatre at Roosevelt University. Any which way you slice it, it should translate into boffo (and well-deserved) box office for the Joffrey. If you haven't been to the Nutcracker for a while, this is your last chance to see the classic. Next year it will be all new, (and having seen An American In Paris on Broadway) equally wonderful. The Joffrey Ballet performs The Nutcracker at Chicago’s Auditorium Theatre Friday, December 4 through Sunday, December 27. The full schedule is: Friday, Dec. 4, 7 pm; Saturday, Dec. 5, 2 pm and 7 pm; Sunday, Dec. 6, 2 pm; Thursday, Dec. 10, 7 pm; Friday, Dec. 11, 7 pm; Saturday, Dec. 12, 2 pm and 7 pm; Sunday, Dec. 13, 1 pm and 6 pm; Thursday, Dec. 17, 7 pm; Friday, Dec. 18, 7 pm; Saturday, Dec. 19, 2 pm and 7 pm; Sunday, Dec. 20, 2 pm and 7 pm; Tuesday, Dec. 22, 2 pm and 7 pm; Wednesday, Dec. 23, 2 pm and 7 pm; Thursday, Dec. 24, 2 pm; Saturday, Dec. 26, 2 pm and 7 pm; and Sunday Dec. 27, 2 pm.